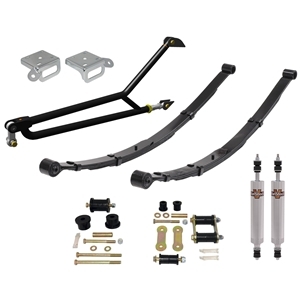 Leaf Spring Suspension System (Stage 5) for 1964-70 Mustang - Includes torque arm, leaf springs, VariShock smooth-body aluminum shocks, leaf-spring plates with tie-down loops, and poly bushing and shackle set. Options: Spring eye style and leaf count, shock valving, staggered-shock spring plates, U-bolt set, adjustable-rate anti-roll bar, and torque-arm-mounts weld fixture. Note: Subframe g-Connectors (TCP SUBFC-01) and center support (TCP SUBCS-01) required for use.